Connecticut’s Beardsley Zoo has two beautiful Ring-Necked Doves named Houdini and Copper who act as Animal Ambassadors in the Education Department. When they walk on the ground, their heads bob with each small step. Originally descended from the African Collared Dove, the Ring-Necked Dove has been domesticated for over 2000 years. Due to their domestication, these birds are quite fearless of humans. However, they do maintain an instinctive freeze response when startled by a shadow overhead, because, in the wild, this may indicate a bird of prey. Ring-Necked Doves have extremely refined navigational abilities. The magnetic tissues within their heads help them to detect the Earth's magnetic field, which helps them to determine flight path direction. Because of their navigational abilities, doves and pigeons were often used as messengers throughout history, especially in times of war. The Ring-Necked Dove is a gentle, slender bird. Individual plumage variation is high, with some light and others almost sooty. The majority of them are a pale sandy brown with a narrow, black half-collar on the back of the neck. They have a white tipped, somewhat long, rounded tail to aid in balance. ​Juveniles have duller plumage and lack the semi-collar of an adult. Their soft, dense feathers detach easily as a defense adaptation. They average 10 inches in length. They weigh between 3 and 6 ounces. Their wingspan is 14 inches. The flight of the Ring-Necked Dove is characterized by noisy wing beats when flying upwards and quiet downward gliding with outstretched tail and wings. Ring-Necked Doves can change direction quickly in flight. They are extremely swift and can fly at 45 to 50 mph. Their eyes are almost black and the area around their feet is a reddish hue. In addition to eating, they use their small, skinny, pointed, black beaks to drink, inflict injury, to produce song, preen their feathers, and build their nest. They can be found in urban and suburban areas, although they are not often found in heavily forested or cold environments. Originally Western Africa; now domesticated and found worldwide, so they do not occur as a wild form. Omnivore – seeds, berries, insects and invertebrates. Although they usually live alone or in pairs, they form quite large flocks around food sources or drinking areas. Ring-Necked Doves breed year round. They are monogamous and pairs mate for life. Nests are built 10 or more feet above the ground. 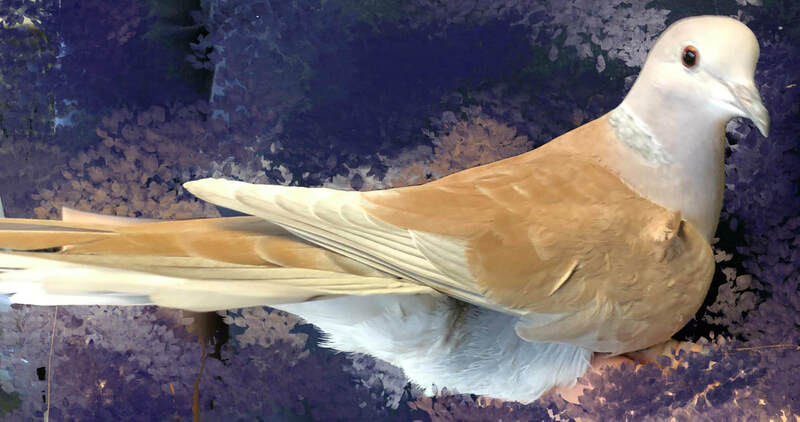 The male dove brings the female twigs, grasses, roots and other nesting materials. The female builds a simple platform nest. A pair often uses the same nest for multiple broods during the year, and may renovate old nests. The female will lay two or three white or cream-colored eggs that are incubated for 15 days by both parents. Newly hatched squabs are helpless, but grow quickly, reaching their adult size in around six weeks. Both parents feed the young on “crop milk,” which is the sloughed lining of their upper digestive pouch regurgitated directly into the squab’s beak. As the young mature, increasingly more seed and grit are mixed with the milk solution until they are weaned and they learn to peck and to eat seeds on their own. The young leave the nest after 14 to 18 days. Up to 12 years in human care.